How Is Horse Riding Beneficial to Children? Sharing a bond with such powerful and majestic, yet soothing and gentle creatures, is one of the greatest gifts an animal lover can enjoy. The benefits of horse riding have been long documented, with humans and their equestrian companions existing together in harmony for centuries. 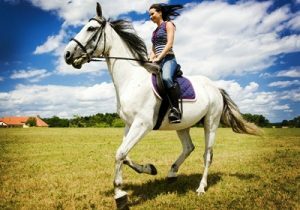 The following articles discuss the joys of riding, and offer tips and advice on how to stay safe, and ensure the best experience possible for you and your horse. Health Benefits – The positive effects of riding contributes to both physical and mental well-being, connecting you with nature whilst keeping you fit, active and happy. Where to Start – Guidance on how to initiate your horse riding journey and take your first steps with your new equestrian buddy. Safety Precautions – Horses are indeed hugely powerful animals, a fact that needs to be respected before a relationship based on trust can begin. Therapeutic Riding – A closer look at how horse riding is doing great things to support and heal people suffering with physical disabilities or mental health problems. Basic Horse Care – General information on how to provide the correct care and attention to keep your horse in tip top shape. Equestrian Competitions – Experienced riders can turn their hand to one of the many sports and competitions available, from dressage to vaulting to polo. Fun Facts – Interesting and somewhat bizarre facts about everything horse related. Five Best UK Trails – A rundown of some of the UK’s most beautiful and rewarding locations for traversing the great outdoors on the back of your beloved steed.